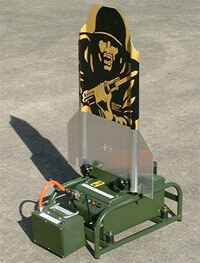 The M3720M Mini Pop-up Target mechanism has been designed for ease of deployment in hostile environments with its light-weight and rugged construction. Its compact size and weight allow for it to be quickly and easily deployed with the minimum of preparation time and effort. It has two way radio communications and can be sited up to 1000 metres from the handheld controller.